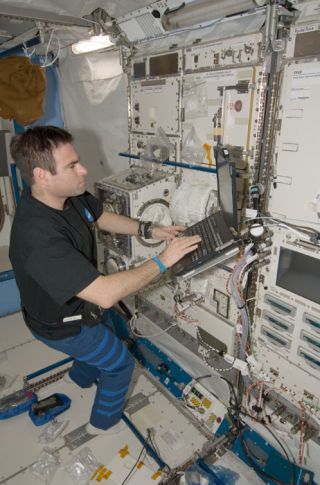 NASA astronaut Greg Chamitoff, Expedition 17 flight engineer, uses a computer while working with an experiment in the Japanese Kibo laboratory of the International Space Station. A virus designed to swipe passwords from online gamers has inexplicably popped up in some laptop computers aboard the International Space Station. The low-riskvirus was detected on July 25, but did not infect the space station?s commandand control computers and poses no threat to the orbiting laboratory, NASAofficials said. ?This isbasically a nuisance,? NASA spokesperson Kelly Humphries told SPACE.comfrom the agency?s Johnson Space Center in Houston. Accordingto a NASA planning document obtained by SPACE.com, the virus wasidentified as W32.Gammima.AG. The California-based retail anti-virus softwaremanufacturer Symantec describes it as a Windows-based worm which spreads bycopying itself onto removable media. It is capable of stealing passwords foronline games and is classified as a very low risk, according to Symantec?s Website. Humphriessaid that while NASA security protocols prohibit discussing details of thevirus and efforts to combat it, a search is under way to find out how it got on board thespace station more than 200 miles (321 km) above Earth. ?We?ll doour best to track down how it got there and close that gateway,? Humphriessaid. ?This is not a frequent occurrence but we have had viruses that have madetheir way on board before.? New flashmemory cards due to launch to the station aboard a Russian cargo ship next monthhave been screened for the virus, the NASA document stated. Not all of the 71laptop computers currently aboard the station run Windows, and those that doand are vulnerable to viruses could be updated, it went on. The spacestation is currently home to three astronauts: Russian cosmonaut commanderSergei Volkov, cosmonaut flight engineer Oleg Kononenko and NASA flightengineer Greg Chamitoff. Volkov and Kononenko are due to return to Earth inOctober, while Chamitoff is slated to stay until his replacement arrives duringNASA?s planned Novemberspace shuttle mission.